The theme this week was food that could be “poked and skewered”. Since I knew it was going to be so unbearably hot I made something that was refreshing to eat and didn’t require much kitchen time. Place a ridged grill pan over high heat for 5 minutes or until very hot. 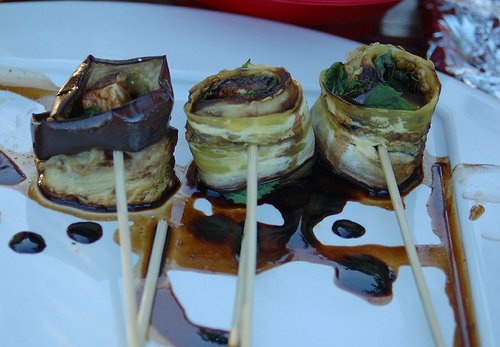 Brush the eggplant slices with olive oil, then charbroil on both sides until translucent and striped with black. Let cool, then cut each slice into two long strips. Take one strip at a time and place a mint leaf on top, then tightly wrap both around a piece of feta. Secure with a bamboo skewer or cocktail stick and place on a large serving plate. Season to taste with black pepper, then drizzle with a few drops of balsamic vinegar.